Get all your official Paige Tyler gear here! Get all your official SEALs of Coronado Gear here! 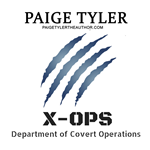 Get all your official X-OPS Gear here! Get all your SWAT: Special Wolf Alpha Team Gear here!